You’re pretty good at hiding yourself beside your favorite duck hole — camouflage clothing, some brush and maybe a little camouflage cloth — but that big, black, yellow or brown dog next to you, that’s another story. He wants to see those mallards come into the decoys as much as you do, and he needs to see them splash down when you make a good shot. So ALPS Outdoorz, which makes all kinds of great outdoor gear, has stepped in to help. The official manufacturer and licensee of Delta Waterfowl gear, it’s added the Alpha Dog Blind to its 2018 product line. 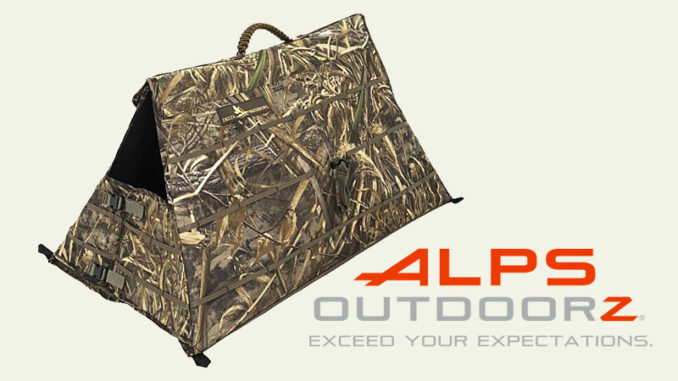 The Alpha Dog Blind is very portable and collapsible; it sets up and breaks down in seconds, and it’s no problem carrying on your back to and from the blind. Shaped like a tent, it proved to be plenty big enough for the 80-pound black lab that shows up on all of my waterfowl hunts, and the padded floor provided him with a nice place to wait for his workout. You can stake it down, and it has dual-swing front and rear doors for easy exit and entry. It comes in Realtree Max-5 camo and has an MSRP of $99.